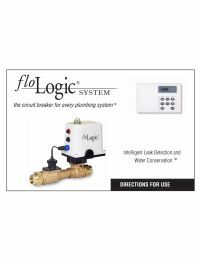 The FloLogic Replacement Flow Sensor for System 3.5 is precision calibrated by FloLogic to detect tiny leaks that help you stop a small problem before it turns into a big one. This year the average household will lose 11,000 gallons of their total domestic water due to undetected leaks. The FSA3002 is a low-flow water sensor that can detect water flow starting at 1/2 ounce per minute. Many competitors use water/moisture based sensors, but these types of sensors are not sufficient for most homes or commercial properties. These water/moisture sensors cannot be used outside even though there are many application that are critical to monitor, such as hose bibs and irrigation systems. Moisture sensors have a difficult time finding small pinhole leaks, or even frozen pipe behind the walls. 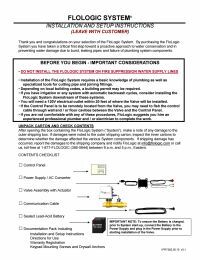 Other issues that are very commonly missed by these sensors are if a toilet flapper valve is stuck in the open position, or if someone leaves a tap running in a tub or sink. 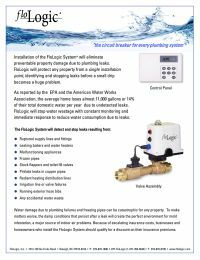 Hundreds of gallons of water can be lost if these types of problems are not caught early.